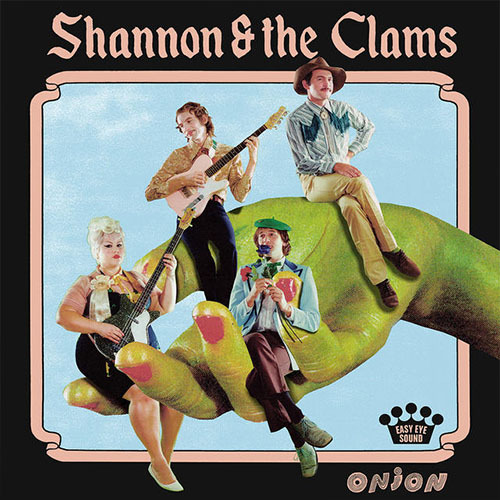 Shannon & the Clams, are known for a diverse sound that incorporates elements of: doo-wop, early rock & roll, classic R&B, garage psych, and surf rock as influences, now releasing their fifth album, Onion. The Oakland-based, indie garage punk quartet is working with producer Dan Auerbach and Easy Eye Sound on this project. Over the last decade, Shannon and her chief collaborator, guitarist Cody Blanchard, have released four albums of ’60s-inspired pop on indie labels, toured tirelessly and have gradually solidified a lineup of devoted Bay Area musicians, Nate Mahan on drums and Will Sprott on keyboards. Onion continues the bands strong points with thirteen catchy, well-written songs, full of beautiful harmonies and twangy, fuzzy, instruments, combined with wild, boisterous vocals. That’s the short of it! Shannon & the Clams have mastered the sound of garage punk, rock n roll, with an oldies overtone. Great songs, prodigious voice, enjoyable music and a hip vibe to match. With a rewarding and refreshing style that is based in the 1950’s doo-wop and 1980s punk rock sounds, with an evolved sound that features a raw punk attitude and a gritty retro feel. The songwriting is first-rate, and the production is equaled. Shannon & the Clams are like an onion, they have lots of layers for you to sink your ears into and enjoy!